I have to confess that although I often crave a perfectly grilled ribeye or filet mignon, a close second (and sometimes a definite first), is a free range Organic chicken. The succulent meat has a tremendous amount of flavor and more often than not, the crisp skin doesn’t make it to the kitchen table from the cutting board. 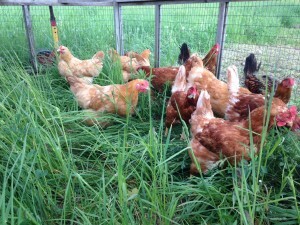 Foraging on grass and clover. I feel that the quality of the meat is far superior to other types of chicken. It’s definitely more juicy and full of that real chicken flavor. We hardly use any spices when we cook these Organic chickens. Lots of customers have commented that it tastes “like chicken did when we were growing up”. I consider that quite a compliment. Since we raise the birds to be a slightly larger size, there is also more breast meat on the bird. This makes for delicious lunches the next day and hearty, warming chicken soup in the winter. The extra flavor of the chicken may have to do with the fact that the birds have access to the outdoors and get to pick at clover, alfalfa and other pasture plants. This increases the Omega-3 content of the meat. We also feed a complete Organic feed ration from Jones Feed mill in Heidelberg. 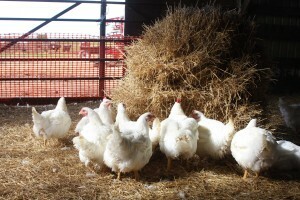 We have dealt with Jones for years and the quality of their Organic feed is second to none. 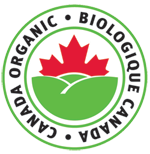 There are no additives, no antibiotics, or GMOs – just high quality Organic grain. Pecking at a bale of straw.